Bharat Techno Air Equipments :- Our Sister Concern Bharat Techno Air equipments (Delhi) is the Authorized Distributor of INGERSOLL-RAND India Limited for Air Compressor Division. We believe that employee satisfaction is very important, our employee is like our family member. In Bharat Techno there is very good platform for the employees and his safe future by different methods. (c) Kids school education facility.
'' We Launch the Incentive plans for Employees to Motivate them in Respective Figures". 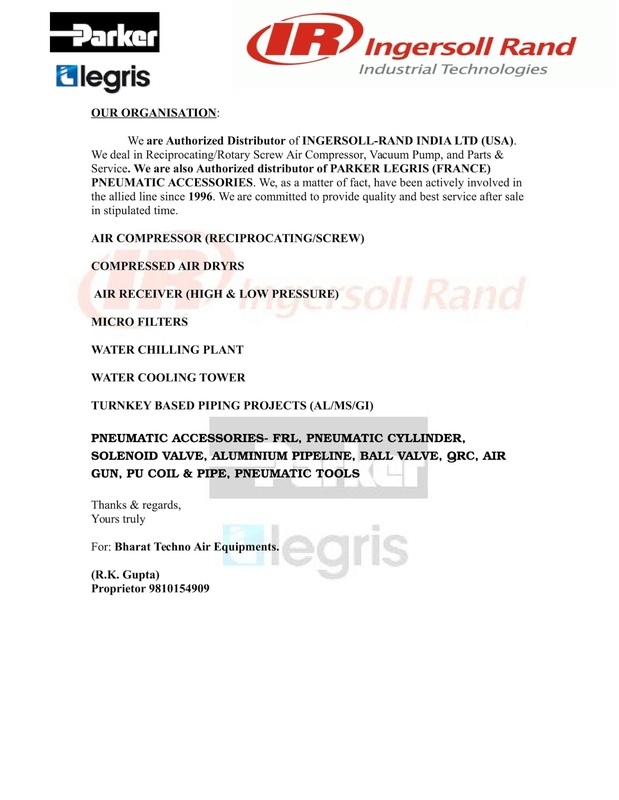 We have started our organization before 20 years on very small level, now we have well established brand in Industrial Water Chillers, Water Cooling Tower, Air Dryers, Air Compressor & Heat Exchangers. It could be happens just because of our quality, planning & commitments as we valued our commitment. Our vision is to spread our company branches in every state of India, so we can easily provide ''After Sale Services" to our valuable clients. Bharat TECHNO AIR EQUIPMENTS All Rights Reserved.